A plethora of technological development in the outdoor sector has finally arrived over the past few years. With ultralight travel daypacks leading the way by embracing new technology and fashion trends that has ultimately depleted the existing pack requirements of decades past. The best packable daypack is now half the weight they once were only a few years ago, though just as functional. On my recent visit home to California I found myself full of anxiety, fear and excitement. It’s been over five years since being back in the Golden State and heaps has changed since my departure to Australia. I’ve been away from family tragedy and a handful of friends achievements which has shielded me in guilt over the past few years. So this trip back home was a necessary one to mend old wounds. Guilty or not, I was ready to visit my family, my mates, my favorite hiking locales and particularly going to see my beloved Oakland Athletics again. All which was accompanied by my trusted daypack throughout and surprisedly found more useful and diverse in nature then I ever imagined. Hence the reason for my words today. If you’re an active minimalist on the go, love the outdoors or perhaps just looking for a better stylish option for your backside storage then continue on. I’ve laid out a handful of the best packable daypack options suitable for all occasions at any moment. One of the best improvements for that extremely lightweight backpacker, whether an advanced hiker or traveling nomad, is the ultralight weight packable daypack. For those that need an explanation, a packable daypack folds up into its own pocket, weighs only ounces, and is perhaps the ultimate travel accessories you’ll discover. I used to scorn the old bulky backpacks! When traveling abroad or even simple day trips, I’d just cram the essentials directly into any cargo pocket of my luggage I could fill and leave the pack behind. However, now with the luxury of light weight packable daypacks, I bring one along on everywhere I go. Literally, I use it all the time. My point being, if you’re sick and tired of lugging that exhausting old back pack around like dead weight and looking for a stylish fresh ultralight weight accessories, then these puppies are perfect for you! These units do offer a variety of options suitable for many applications. So it’s important to consider your specific requirements to best determine the best purchase for your new pack. The pack’s capacity will regulate how much storage space you can take with you. The higher the capacity doesn’t always equate to a better pack. If you only plan to use the bag for small outings, day trips or perhaps a journey to the shopping mall then smaller is better. However, if you plan to use it on extensive outdoor hiking adventures then more capacity becomes a better options. You’ll need to decide how you will be applying the pack into your life. A daypack is only as functional as you decide. Meaning, find what’s most important. Some packs permit for versatility and functionality to be carted over the shoulder, as opposed to the standard backside packs. 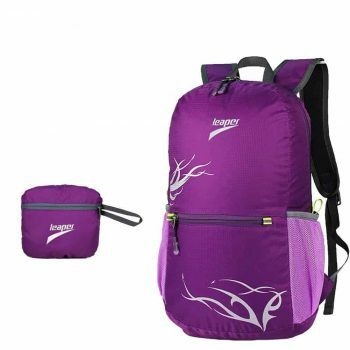 Therefore, your desires, preferences and motivations are vital in selecting the best packable daypack. Pending the pack you choose, most daypacks are now more segmented than ever before because of the globetrotting, on-the-go, highly active lifestyles we live. This in turns offers some packs with committed compartments for important travel documents and accessories like your passport including airline boarding passes, smart phones, wallets and other useful items all within easy reach. The bottom line is that I highly endorse daypacks to anyone actively traveling, hiking or doing anything else that may require an additional personal storage. However, you won’t want to use them in every situation. They are ideal for day trips about while the rest of your equipment sits idle at home base. Keep in mind, these packs are light weight and super thin, with minimal protection from environmental conditions. It’s recommended to carry basic loads, and in most cases nothing fragile, unless you’ve taken the precautionary means of protection to ensure fragile items are well shielded. The basic daypacks are perfect for jackets, food, water, first-aid and miscellaneous accessories, in which case they’ll do quite nicely. Designed with versatility in mind, the Ultra-Sil day pack is useful for everything, from alpinist adventures to everyday shopping. Constructed from siliconized Cordura and Ultra-sil fabrics, making the bag both extremely strong and ultra light weight at the same time. All stress points on this bag have been reinforced to ensure your bag remains durable and lasts longer. Another great feature of the Ultra-Sil day pack is its ability to pack down remarkably small, allowing it to fit easily in to your pocket. Also included in the design is an attached mini stuff sack, making it easy to take anywhere and everywhere with you. There is even a Hypalon key ring attachment, giving you yet another, easily accessible, option for carrying your bag. The Ulta-Sil bag comes with a waterproof roll top closure, to help keep your valuables dry. To give you an additional layer of moisture protection, all seams of the bag have been fully taped and the whole bag has been siliconized. You can relax and enjoy your outdoor adventures, knowing you always have a place to put your personal items that cant get wet. Whether you are hiking, traveling or just plain grocery shopping, this bag is so compact and light weight, you can take it everywhere with you. You’ll love knowing you’ve always got a bag on hand, should you need it. 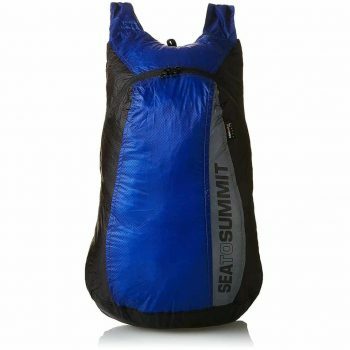 Related: Sea to Summit Ultra Mesh Stuff Sack, for additional place to ‘stuff’ small personal items. Dimensions: Open size: 10.2 x 8.3 x 17.3 inch; Folding size: 5.1 x 5.1 inch, with 25 L volume. High quality water-repellent nylon + Smooth Zipper. Stress points reinforced with bar tacking. Durable 2-way Abrasion Resistant SBS Metal Zipper. Best use: Casual daypack, travel backpack, outdoor rucksack for hiking, cycling, camping, trekking, mountain climbing for men and women. It is also an ideal gift for everyone. Searching for that one bag that you can use for everything, that can be used for travel, hiking, camping and much more. Look no further. The Leaper Outdoor Ultralight Backpack has been designed with versatility and durability in mind. The superior durability of this backpack is second to none. Made from a premium, water and rip resistant nylon fabric, this backpack is made to last. All stress points have been reinforced to give your bag a longer life. Feel good knowing this bag will remain strong for all your shopping, travel and outdoor activities. Constructed so you can stay organized, this backpack includes one large compartment and several other pockets for storing all your bits and pieces. Also included is a secure zippered internal pocket, so you can rest assured your valuables will be safe in your backpack. There are even two side pockets, perfect for water bottles or umbrellas. This backpack can be folded or stuffed in to its own pocket, allowing you take it with you anywhere and everywhere you go. The backpack folds down to approximately 5″ x 5″ and is impressively light, weighing only 0.66 lbs. You’ll always have a bag on hand, and you’ll never even know you are carrying it. And when you have to carry it, enjoy the comfort of the adjustable, padded shoulder and chest straps. Just what you need for any of your longer outdoor activities. This ‘take everywhere’ backpack is a must for everyone. You wont regret getting yourself one of these. Built to be easily attached to several larger Osprey back packs, and versatile enough to be functional on its own. 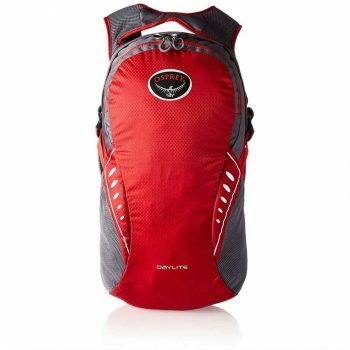 The Osprey Daylite Backpack is an absolute must for hikers, climbers, campers and all outdoor enthusiasts. Attach it to your Osprey Add-on series backpack to give you additional carrying room. 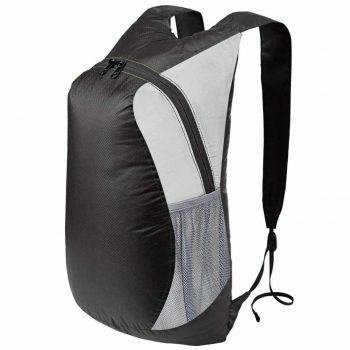 Or use it as a day pack, when venturing off from base camp for the day. The Daylite Backpack will allow you to stay organized on your next outdoor adventure. The design features a multi-functional interior sleeve, large enough to hold your tablet. Two side mesh pockets have been included, a place to store your water bottles. The front pocket, with mesh organizer, gives you an easily accessible place to store your personal items. And there is even a place to securely clip your keys!. You’ll stay cooler with this backpack. Constructed with a mesh, slotted foam back panel, spreading the weight evenly across your back, giving you better ventilation. Tuck away mesh shoulder straps have also been included, to ensure comfort when carrying this backpack. The versatility this daypack has to offer, makes it essential to your next outdoor adventure. Related: Osprey Hydraulics Reservoir, stay hydrated without the weight, with this premium reservoir. Dimensions: 20 L: Unfold: 16.92 x 10.63 x 7.08 inches, Fold: 6.29 x 5.90 x 1.97 inches 33 L: Unfold: 19 x 13 x 8.2 inches, Fold: 6.29 x 5.90 x 2 inches. Folds into zippered inner pocket. Main compartment, two front zipper pockets, one internal security zippered pocket and two side pockets. Looking for a true space saving backpack? Look no further. The New Outlander Hiking Backpack Daypack features superior durability, packability and is extremely lightweight. Perfect for any minimalist who needs the extra carrying capacity, without the added weight and bulk. Folding easily into its own zippered pocket and weighing less than 0.5 lbs, makes it an essential to take with you everywhere you go. You’ll love the stylish, classic design of this daypack. But what you’ll love more is its functionality. It has a large main compartment and several pockets, allowing you to stay organized and store all your personal items. The internal zippered pocket is a great place for you to secure any of your valuables. For items you need easy access to, there are two zippered pockets on this day pack. Water bottles and umbrellas can be stored in either of the two side pockets. So what are you waiting for? Get yourself one or get one for all your friends and family. 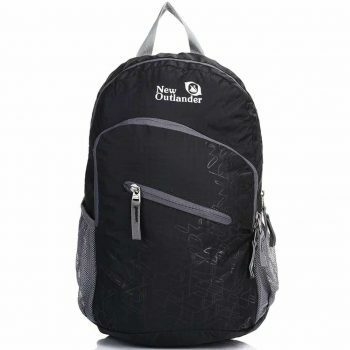 Related: LARGE New Outlander Lightweight Backpack, same great features as the smaller backpack, with additional room! Large main pocket to carry what you need. Pack-in pocket doubles as a inner pocket. Bottle holder on the both sides. Made with high quality water and tear resistant nylon material, with SBS metal zipper and bartack process. Best Use: Day trips, vacation, travel, day hikes, school, camping and shopping. 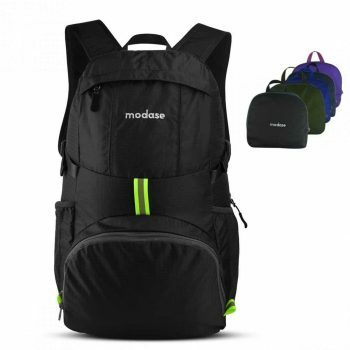 Looking for a backpack that is stylish, lightweight, compact and durable, Modase Packable Backpack Daypack ticks all those boxes! Made from a high quality water and rip resistant nylon, you’ll have peace of mind knowing your backpack is built to last. All stress points have been bar tacked and an SBS metal zipper included to increase the durability and longevity of this backpack. The pack is a true ‘space saver’. Can be easily folded in to its own zippered pocket and unzips in to a backpack in a matter of seconds. Packs easily into your suitcase or handbag, and is so light weight, you won’t even notice you are carrying it. The breathable mesh shoulder straps, means better ventilation. Sponge on the straps has been used to increase your comfort while carrying this backpack A chest strap has been added, so you can secure your belongings snugly to your body. Related: Modase Premium Packing Cubes Set, 4-piece organizer bags with laundry bag, for those that want to stay extra organized! Mesh, adjustable shoulder straps with sponge padding, chest strap with a whistle buckle. 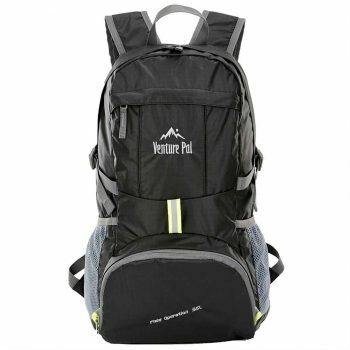 Whether you need a back pack for travel, everyday use or outdoor activities, Venture Pal Hiking Backpack Daypack is the perfect companion for all your adventures. Designed with durability and long lasting performance in mind, it has been constructed from premium tear and water resistant nylon. Given additional strength, with bar tacks on all stress points and a double layer bottom piece. You’ll be amazed at how much this backpack can hold. The backpack folds conveniently and easily in to its own zippered pocket. Unfolds in seconds, when you need to use it. Small and light enough to be packed in your bag, so you’ll always have extra carrying space on hand. The multi-compartments allow you to keep your things organized. There is one large, main compartment, with two separators, for even greater organization. The two zip, front pockets are ideal for any small personal items that need to be easily accessible, perfect for holding your mobile phone. There are also mesh, side pockets for storing water bottles or umbrellas. Breathable, mesh shoulder straps have been used to ensure greater ventilation. And the sponge padding on the straps, ensures you are comfortable when carrying this backpack. A chest strap has also been included to allow you to secure the pack to your body. Comes with a lifetime warranty, so there’s no risk involved when purchasing this backpack. Related: Venture Pal Sling Shoulder Crossbody Bag, perfect for day trips away from base camp or just plain shopping. If you are looking for a day pack, that is compact, light weight and durable. Then look no further. The SNOWHALE Packable Day Pack has been constructed from a high quality, tear resistant, nylon fabric. With the added strength of back tack reinforced stitching, on all stress points, you’ll rest assured this bag won’t tear and will last a long time. The water resistant nylon feature, means you can carry your tablet or any digital items with confidence, knowing they will stay dry. Folding easily in to its own pocket and weighing only 85 g, you can take this day pack anywhere and everywhere with you. You’ll always have a bag on hand, and won’t even notice you are carrying it. And when you do have to carry it, the breathable, mesh shoulder straps will ensure it is comfortable on your back. The straps are fully adjustable and lock firmly in to place. The design includes a two-way zipper closure, giving you convenient access to your belongings. If you are still not convinced, then try it for 50 days. Snowhale offer a full refund, within 50 days, if you are not 100 percent happy with your purchase. So what have you got to lose? get one now and see for yourself. Related: SNOWHALE Waist Pack with Water Bottle Holder lets you carry extra water and it’s a great place to secure your keys as well. Did you find what you’re looking for? Everyone has different needs regarding their packs so don’t feel overwhelmed if I didn’t include a pack that was suitable for you. With so many options available on the market, from so many quality manufacturers, there’s a perfect fit just waiting to be purchased. Do your homework (if needed after this guide) and lighten your load for your next outing. With a trusted daypack strapped on, there’s no stopping you! So where will you go now?